Has it really been almost a month since I posted? Time sure does fly when you’re having fun. Thanksgiving this year was different for us as we traveled to Des Moines to spend time with my sister and her family, rather than them traveling to Springfield. The traveling gods were on our side as we had good driving weather, no issues and time to come home and relax before the week began. Steve and I left Wednesday around noon and arrived in Des Moines in time for dinner. As usual, we were greeted in the driveway by two excited little girls who were happy to see Uncle Steve and Aunt Tammy. Everyone should be greeted with such enthusiasm! Shortly after dinner, the girls went to bed and the grown-ups settled down for some music and wine. The weekend was off to a great start. Thanksgiving Day we enjoyed coffee and the Macy’s Thanksgiving Day Parade before heading to Blair’s parents for dinner. Mary Kay and Everett live in a spacious condo on the West side of Des Moines so hosting dinner was not a problem. Blair’s aunts, Linda and Kaye, were also invited so it was a nice gathering of family. With temperatures nearing 70 degrees, the girls re-introduced us to the game Foursquare and we spent most of the time outside in a heated game. Julia is the athlete of the two and takes her playing seriously. She’s quick to tell you the rules and point out when you break them. Naturally, she’ll argue her case if you call her out on them! Lydia just wants to keep up with her older sister. After lunch and several games, we took a long walk around the neighborhood. Mary Kaye and Everett’s subdivision has a nice park and miles of walking trails so we managed to work off a little bit of our delicious dinner. I was in the lead with MK and Kaye (the competitive one of the group) so I got to hear some family gossip. As the day progressed, the weather started to turn cooler and the wind picked up. Once it was dark, we decided it was time to leave and begin the Christmas celebrations by taking the girls through Jolly Holiday Lights. This is a drive-thru light display that helps raise money for the Make-A -Wish Foundation. It’s really cheesy, but the girls love it. We think it’s more about the fact they get to climb around in the car rather than actually seeing the lights. Friday we had decided not to contribute to the morning madness of Black Friday, but went to the DM Art Center instead. While I conducted some business in the gift shop, Steve took the girls around the museum, which is really impressive. After lunch, the boys went one way and the girls went to the mall (really) so Ralph could get the little ones new shoes. Yes, it was nuts, but we scored a great parking place and managed to get new shoes for the kiddos without any issues. Friday night was for the adults. We went to a great downtown restaurant called Centro and had pizza and wine. Then our “dessert” was fancy cocktails at another place before we headed home early. Tearing up the town was not on our agenda. *Sigh* I think we’re getting old! Saturday, the Smith family had a lot of things on their social agenda so Steve and I took off around 11 a.m. We made two stops at local resale shops where I snagged a new Kate Spade handbag for only $58. Then it was time to say goodbye to DM and head for home. As always, I spent Thanksgiving being thankful for my wonderful family and friends, thinking of those who were no longer with us and counting the many blessings in my life. Losing a pet is always tough, and Littles left some big paws to fill. We knew we’d eventually get another cat but didn’t know when the time would be right. Tidbit needs companionship since we’re gone during the day so we started looking shortly after we lost Littles. A trip to Petsmart to visit the cats/kittens from local no kill shelters was good, but we didn’t bond with any of them. The next week, my father-in-law, Pete, was playing on the local Humane Society website and found a cat he thought looked really good so he sent us the link. “Amy” was a pretty cat, that’s for sure, but we still weren’t convinced it was time to take the leap into new cat ownership. Frankly, I’ve been nervous about how Tidbit would react since he tends to be a jerk. 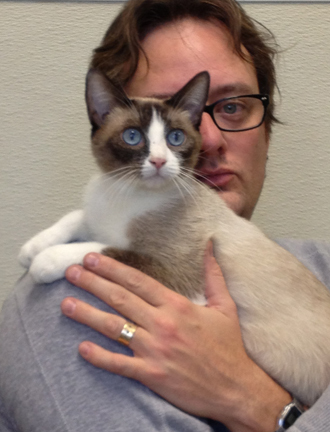 Steve was convinced we needed a kitty but I wasn’t sure we were up to the challenge of all that energy. Saturday, we left the house thinking we’d have a day to ourselves. The first stop was lunch at That Lebanese Place, a food truck we’d heard rave reviews about. The reviewers weren’t lying; we’ll return! Between bites, we decided to take a trip to the Humane Society “just to look.” Yeah, right. Upon entering, we were greeted by a gang of kittens named after playground equipment: Teeter-totter, Swingset, Merry-go-round and Slide. They were adorable. This was going to be tough. Pete and Diana met us there so we all went into the cat area to look around. I was immediately taken by an energetic little black kitty with white tufts coming out of her ears. She was ready for playtime! Steve was more cautious than I because I found myself bouncing from cage to cage holding out my fingers (despite signs telling me not to do that!). I was loving on an orange tabby, but knew we couldn’t have him because he was male and we needed a female. We got out a couple of cats, but none were a good fit. Then we met Amy. She sure was pretty. Big blue eyes and gorgeous coloring. She was a little shy, but became lively and curious when we got her out of her cage. She plopped down and began purring when we scratched her ears. We were done, that’s for sure. Pete and Diana agreed she was a looker and quite a sweetie, but we wanted some one-on-one time with her, so we took her to a private room to bond. That was it. The little girl was coming home with us. Pete and Steve took care of the paperwork while Diana and I perused the other “kids.” I wanted all of them. Monday, Amy had her spaying and I picked her up from the Humane Society after work. She was alert, but cautious. She’s currently residing in the guest room with her own bathroom, new food dish (of course), toys and all the room she needs to roam. She enjoys being under the bed, but has become more animated and outgoing in a short 24 hours. She’s a lover and we’re over the moon. Her name will be changed because she’s not an “Amy.” I’ll keep you posted on her progress. Thanks to Pete and Diana for all their help in finding our new family member! 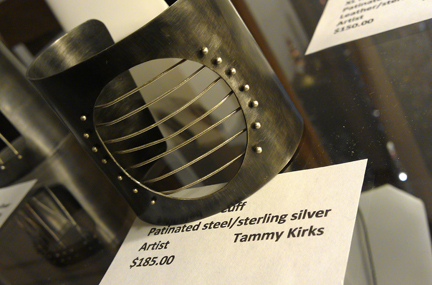 Last Friday, my new steel line debuted at Waverly House Gifts and Gallery. The opening night reception was a great success and I enjoyed spending time with the many friends and family who came to offer their support. If you’re a regular reader of this blog, you may remember that I’ve been working all summer creating new pieces using steel, sterling and gold. It took me several months and a lot of experimenting, but I think I have found my design voice in this material. I’m loving the look I’m achieving with the mixture of metals. Steel is great because it’s inexpensive and strong, but it’s dirty and takes more time and patience. In the end, I get a look I can’t quite achieve with silver. I also feel like I can experiment more with it since the cost of waste is much less than it would be in silver or gold. If you missed the opening reception Friday, the show continues at Waverly House through October 27th. Stop by and see it if you have the chance. I don’t think you’ll regret it! Marriage is work, that’s not news. The best relationships, whether they’re marriages or great friendships, take work from both people to make them successful. In a long-term marriage, sometimes you’re the strong one and sometimes you’re weak. Usually, both people aren’t weak or strong at the same time. Unfortunately, Steve and I have been a little weak lately and it’s been hard to prop up the other person. Fortunately, this is temporary and we know it. We’ve both been stressed at work and have brought it home. The three-day weekend was good, but unfortunately, we have several other house-related issues to deal with. Early last week, the speaker on my cell phone started sounding static-y. I thought it was everyone else’s phones, but soon discovered it was mine. We cleaned it out really well, but that didn’t solve the problem. Now, the volume has faded significantly. Good news is that Steve is traveling to Kansas City tomorrow and will take it to the Apple store for me. One problem solved. Then, the hard drive on the computer quit. Kaput. Now, since I’m married to a tech wiz, he had installed Time Machine, a back-up system that saved everything from complete failure. Once Steve had assessed the situation, he managed to set up a temporary solution with an external hard drive. Man, this guy is good! While not perfect (no back-up in place) it will suffice until he can buy the new hard drive and install it. Second problem temporarily solved. Last night, I went to feed the cats and discovered the drain in the basement was overflowing. The sump pump wasn’t working. Steve first checked the breaker, then jiggled the pump to see if it was stuck. It made noise, but didn’t pump. We suspected a rock from the bottom of the pump area had been sucked into the pump, gotten stuck and the motor burned out. Grrr. Luckily, Lowe’s was still open and Steve had some birthday gift certificates he was willing to use for a new pump. He got home around 9:45 p.m. and proceeded to do the install. Of course, he accidentally bought the wrong size connectors. Good news is that we have something in place temporarily until he can make the exchange and finish it tonight. Third problem to be solved today. So while things have been stressful and machines keep breaking, at least I’m married to a guy who knows how to fix the problems. Thanks Steve, for being my husband, my best friend and my handyman. I love you!